1. What communities’ does K-Net Mobile 3G Data work in? 2. Will my K-Net Mobile 3G Data work while I am in Sioux Lookout, Thunder Bay or Winnipeg? Not yet, we currently have no roaming data. 3. Will my K-Net Mobile voice and text still work while I am in Sioux Lookout, Thunder Bay or Winnipeg? Yes, voice and text are not affected. 4. Will other carriers be able to work in my community? 5. Will other carriers still be able to voice and text in my community? 6. If my community doesn’t have 3G Data, when will we have it? We are working hard at getting all our communities to 3G Data. Technicians will be traveling to communities to complete 3G Data upgrades over the summer. Each community will be announced as they are 3G ready. 7. How do I get a K-Net MyAccount? Sign up at https://myaccount.knet.ca Click on “Sign Up” button and fill out the following fields. Note: Please use your name for the username, not your phone number. Note: Make sure your email and other information is correct before clicking the “Sign Up” button. Once complete, this notification will pop up on the screen. And you will need to check your email. Click on the link provide by the email to complete the Sign Up process. Note: Please check your junk mail, if you cannot find it in your inbox. 8. How do I change my default PIN? It’s easy, anyone can do it. Follow these easy steps on your phone. 10. How do I add funds with KM Vouchers to K-Net MyAccount? Click on the Add Funds icon or the Add Funds link. Enter the KM Voucher number in the field as shown below, then click “Use Voucher” button. The Voucher Transaction Successful pop up window will appear to confirm your KM Voucher No. is successful. Click the “OK” button. You will see the funds are now added to your MyAccount Balance. 11. What to do when a KM Voucher fails to redeem? Please check you voucher number again. Contact the KM Community Representative to verify if the voucher was activated. 12. How do I add funds with a bank card to K-Net MyAccount? Scroll down to the Debit Card area. Select the amount you would to purchase. Click on the “Use Debit Card” button. The Interac Online page will load. Click on the Financial Institution you would like to use. If you select the BMO. Interac Online will take you to BMO’s log-in page. 13. How do I transfer funds to my K-Net Mobile phone? Click on the Mobile icon. In the Amount field enter the amount you would like to transfer and click on the “Transfer” button. Note: Please only use whole dollar amounts and don’t include the decimal point in the amount field. It will cause an error. A Transfer Operation Successful pop up window will appear. Click on the “OK” button. You will see the funds are now added to your K-Net Mobile Phone Balance. 15. How do I know if data was added to my phone? In myaccount.knet.ca, your available data will be on right hand corner of your phone number. 16. How do I change my APN in my phone settings? 17. I can’t sign into K-Net MyAccount? Did you receive your confirmation of account setup email? Did you click your confirmation link? Did you click forgot password? Did you use the temporary password? Did you try using a computer? 18. I can’t add my K-Net Mobile phone to MyAccount? Make sure you are entering the complete 10 digit phone number- 1-807-212-xxxx? Try adding or removing a # symbol to your PIN? If you are using a Apple Device. You need to click the downward arrow above your keyboard to go to the PIN field. How to setting-up K-Net Email on iphone 7? Customer calls #8255 and is asked for 11 digit pin. When entering number and pin it says "not authorized". These systems rely on caller ID to identify the caller. If caller ID is disabled then the system needs to ask for the 11 digit number. Because of abuse issues, we can only allow customers with caller ID enabled to access the prepaid system with the default pin. So a customer with 0 balance (or negative balance) and default pin number and caller ID disabled will not be able to access the prepaid system by any means. How does it K-Net Mobile Prepaid work? Manage your account by adding dollars for the service. If I disconnect my cell phone, is there a charge for me to connect again? No, we don't charge you to connect or disconnect your cell phone service. You can come and go at any time for free. No, we do not use long-term service contracts. Where will my phone work? The KM prepaid mobile wireless service will work on the KM Community Network and in the TbayTel extended calling area. The airtime and LD per minute usage rates will be higher when a customer is on the TbayTel network. 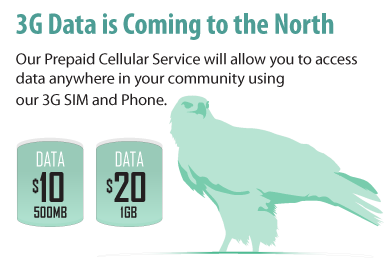 If you require service in other areas of Northern Ontario, Canada or North America you will have to purchase a service package from an existing GSM carrier. Rogers Wireless (http://rogers.ca) and TbayTel both offer GSM service in Canada and have roaming with other North American carriers. Do I pay when someone calls me? You pay for the amount of time that your phone is in use. You can receive calls from long distance numbers without paying long distance. Yes, the KM prepaid service allows you to make local and LD calls at the designated rates. You also have the option to use conventional LD calling cards to make a long distance calls. How do I pick my number? Can I keep my existing number? Unfortunately, you cannot keep your existing number. When you sign up, your community cellular network office will provide you with a phone list, and you may choose your new cell phone number from that list. Why does caller ID sometimes not work? For KM customers calling other KM customers, Caller ID will display as normal. However, when a caller is using a community gateway number to make a land-line to mobile call, the gateway numbers will appear on Caller ID. If you call the community gateway number back, you will not reach the caller. Where can I buy minutes, phones and cards? Phone cards and phones are available from your community KM office. You can top-up your account by purchasing minutes from your local KM office. Online purchases with a credit card is being added to the service. Yes, SMS text messages will show the message sender in all cases, even if it is a message from another network. Will SMS text messages show up on Caller ID? Who do I call for help with my phone? There is a cellular technician in your community. We will will adding this information to this web site as it becomes available. What is my default password (for adding minutes from a landline)? Your default password is the last 5 digits of your cell phone number. How do I enable or disable Voice Mail on my phone? You can enable or disable voice mail on your phone by contacting your local community partner. In the near future you will be able to enable/disable voice mail when adding minutes to your account. How do I switch to KM from my existing network? If you have signed a long-term service contract with another carrier, you may have to buy your way out of the contract. If you are currently with Telus or one of the Mobility companies your existing digital cell phone is CDMA rather than GSM and will not work on the KM network. You will need to buy a new cell phone. Will my existing cellular phone and service plan work on the KM network? The KM network will support roaming for customers of all of the Canadian and most US carriers that use the GSM standard. Digital cellular systems use two main competing network technologies: Global System for Mobile Communications (GSM) and Code Division Multiple Access (CDMA). GSM, being an international standard, is better suited for national and international roaming, provided you own a quad-band cell phone (850/900/1800/1900 MHz). On a GSM phone your account information along with your contact list and other personal data are stored on a SIM card (Subscriber Identity Module) which is a small chip you can freely remove from your phone. When you get a new mobile device, you can simply insert your SIM card into it and it will work with your current account information and contact list. If you travel to another country, it is also possible to purchase a prepaid SIM card which you can use to avoid roaming fees. To upgrade your phone, you simply swap the SIM card in the back. The chief GSM carriers in the United States are Cingular Wireless, recently merged with AT&T Wireless, and T-Mobile USA. Multimedia messages, video, high-speed Internet access, digital camera and PDA functions can found on both technologies. A Subscriber Identity Module (SIM) card is a tiny removable chip that fits into the back of your phone that allows phones to be instantly activated, interchanged, swapped out and upgraded, all without carrier intervention. The SIM itself is tied to the network, rather than the actual phone. Phones that are card-enabled can be used with any GSM carrier. CDMA carriers do not use SIM cards. They require proprietary handsets that are linked to one carrier only. By purchasing a SIM card with minutes and a local number in the country you are visiting, you can make calls against the card to save yourself international roaming charges from your carrier back home. Will my Blackberry (PDA) work on the KM network? The KM network will support Blackberry if you are currently with a GSM carrier, once DMTS establishes their roaming arrangements with Rogers. Do you have internet or data capability? The KM network supports the GSM EDGE data standard for both SMS text messaging and Internet browser applications. Could you explain which calls are local and which are long distance? All mobile calls are billed airtime, for both incoming and outgoing calls. Airtime is measured in whole minutes - a 10 second, 30 second, or 59 second call will all be billed as a 1 minute call. Long distance (LD) is determined by the phone's location.